Quantity Per Pack: 30 No. We are offering Silicone Mould Release Spray to our esteemed clients, used specifically as a mould releasing agent in plastic objects. We offer Mould & Die Protector and die protector Tape Ink that is specially prepared for reverse printing on BOPP film. This ink can be used for printing purposes on coated film as and on all types of machines. We make use of a perfect mixture of toluene and ethyl acetate that acts as a reducer for the ink to make the ink in compliance with the industry standards. •Used for preventing corrosion and rust. 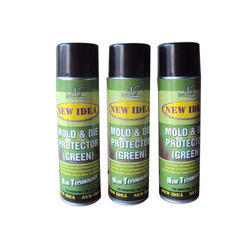 we offering wide range of V72 Mould Protector Spray. 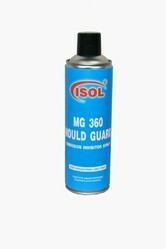 As per the changing needs and desires of our customers, we have come up with a broad consignment of Mould Sprays. Using technically advanced tools and techniques, these offered products are developed with superiority. Apart from this, these could be modified to match with the changing needs and desires of our customers. This is anti corrosion spray which is not required to be cleaned before mounting the mold. All the protection spray is removed within one or two shots and remaining shots are as per requirement. This is specifically used where jobs are transparent & contamination from mold protector rejects the jobs. It saves raw material, time & labor. In order to keep pace with the ever growing demands of our clients, we are involved in offering a wide range of Mould Spray. This Mould Spray is formulated by our skilled professionals by using sophisticated technology and fine quality of materials. Our product is widely appreciated for its easy uses and reliability.